Did you know that Skechers offers an entire collection of utility and safety footwear designed to protect on the job? In fact, Skechers has the #1 WORK brand in the United States. 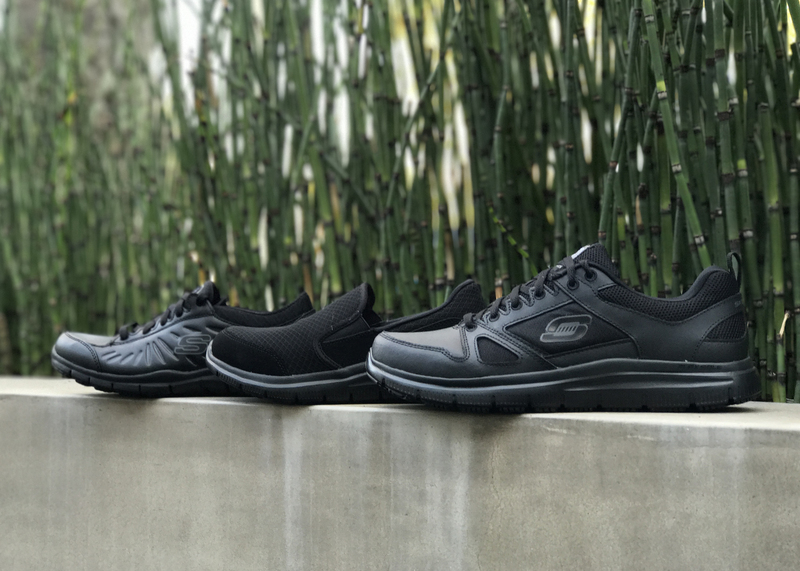 We designed the Skechers WORK collection for men and women working in kitchens, hospitals, warehouses, janitorial, construction and more. Every style includes features that protect against one or more dangers including slippery surfaces, impact, water and electrical hazards—each independently tested and certified to rigorous industry standards. Our slip-resistant outsoles follow the ASTM F1677-2005 Mark II testing standard on clean Red Quarry tile and meet or exceed a result of 0.40 under wet or oily conditions. Styles that offer Electrical Hazard protection meet ASTM F2413-20011 EH requirements and are constructed to resist disruptive discharge to the ground under 18 kV 60Hz AC for one minute with no current flow in excess of one milliampere under dry conditions. Electro-static Dissipative styles are designed to reduce the accumulation of excess static electricity by conducting body charge to the ground following the ASTM F2892 standard. Skechers WORK Safety Toe footwear offers a variety of impact protection options in the toe cap all meeting or exceeding the ASTM F2413-2011, I/75 C/75 standards for impact and compression. Steel Safety Toe styles feature a more traditional hard steel protective cap over the toe area. Lightweight Safety Toe styles feature a toe cap protected by an alloy material created with ultra-lightweight, durable and high-grade materials for superior strength and comfort. Lastly Composite Safety Toe series footwear delivers the same level of protection and comfort using a non-metallic composite material. Select styles also include Waterproof protection designed to keep feet dry for at least eight hours in water or wet conditions tested with the SATRA TM77 method utilizing membrane and seam-sealed construction. 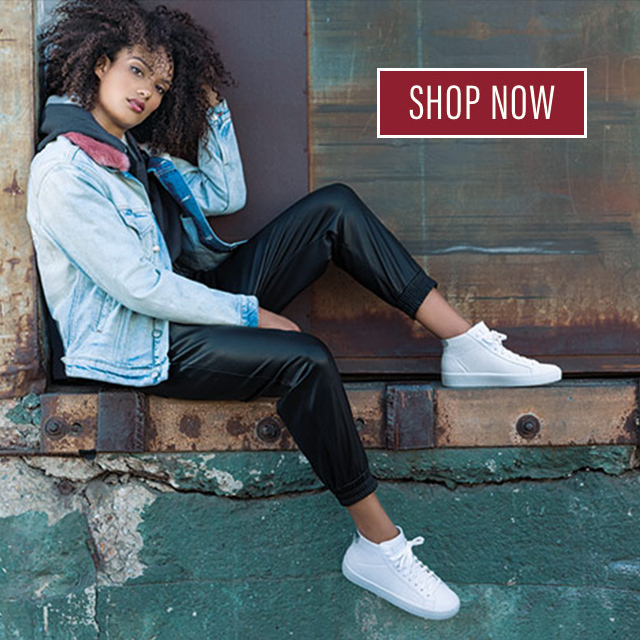 And best of all many styles in the collection are special versions of trendy Skechers profiles designed with a Relaxed Fit to give extra space in the toe area plus a soft Skechers Memory Foam insole for enhanced comfort when you must be on your feet all day. These shoes and boots look great, feel amazing, and help keep you safe throughout your shift. Take a look at a few styles from the collection above—all three protect against slippery surfaces and electrical dangers. For women who want a traditional low profile sneaker the Relaxed Fit: Eldred SR on the left is a perfect option. Or for those who prefer an easy-on, easy-off design there’s the Relaxed Fit: Cozard SR seen center. And for men, the Relaxed Fit: Flex Advantage SR to the right is a popular traditional sneaker that that gets the job done. Or browse the entire collection at skechers.com to see more options including rugged safety toe boots. We want you to understand how Skechers WORK slip-resistant footwear can positively impact on your day on the job so we enlisted the great Kelly Brook to help convey the story in the commercial below. Check it out and if you’ve worn WORK footwear on your job, tell us about it in the comments! When it comes to taking life goals seriously, no one inspires our office better than Stress Monkee guru (and Team Skechers expert) Alicia Murphy! Here are her tips on how to continue your New Year’s Resolutions all year round. Here we are, good ol’ January. That time of year where many of us declare our unwavering commitment to making changes. Yet, somehow when February rolls around (or maybe even sooner) we end up going right back to our old ways. According to research (University of Scranton) only 8% of us achieve our Resolutions. What gives?! The problem isn’t a lack of information. Nowadays, you can Google your way to being an expert in anything. But listen, if you’re starting to slip on your New Year’s Goals, don’t sweat it. Tomorrow is a chance to start again. Aaaaand, I have a little something to help you out. If you’re scratching your head wondering what in the world I’m talking about, check this out. One of the biggest reasons we don’t reach our goals is because we take on too many changes at once. We create a massive “to do” list of changes to reach our goals. We try to make changes in all different areas. Our weight. Our health. Our finances. Our job. Our relationships. Phew! I don’t know about you, but my life can get hectic. Trying to keep up with all those changes in different areas can only last for so long. Focus on only one area of your life that you’d like to change at a time. My favorite way to do this is have a “theme” each month. Maybe January is weight loss month. Then February is relationship month. Then March is health month… and so on. I know it seems like it’ll take longer, but doing it this way means the changes will stick. You can totally reinvent yourself by this time next year! Alicia works out in Skech-Air Cloud. Okay, now that you’ve picked one area of your life, how do you make change happen? You pick one thing that takes a small amount of effort, but will give you the most results. By doing this, you’ll be taking some of the “pain” out of change. Trust me on this one. If you start small, you’ll build up momentum and you’ll start to see dramatic results. Think about the change you want to make happen, and then ask yourself, what is the ONE thing you can do that will get you results? Remember, it’s got to be something that you know you can stick to. Example: I want to drop 10 pounds. What are some things I could do (that I know I could stick to) that will get me results? Brainstorm time! Write your ideas. Make sure you pick only one thing. Master it and then move on to the next thing. Bam! I seriously cannot emphasize this step enough. The secret to success is found in your daily routine. This is the biggest mistake I see people make when it comes to getting in shape. They quit. The ONE thing you chose in Step #2… stay consistent with it, and you will reach your goal. It’s as simple as that. We’re trying to create new habits here. To do that, you must do something over and over again until it becomes natural. And it will become natural if you stay consistent. Give yourself a time frame for your ONE thing from Step #2. I recommend at least three weeks, but I like the idea of doing something for a whole month even better. At the end of 30 days, if it still doesn’t feel natural, recommit and go again. Alicia stretches in Skechers Burst 2.0 – New Avenues. What “identity” have you labeled yourself with? If you say things like, “Ugh, I’m so fat – I need to go to the gym,” then guess what… your body will believe it. In other words, whatever you continually label yourself as, your body will work to make it true. I’m stressed. I’m tired. I feel yucky. I’m fat. Start to act as if you are already that person. Taking our example from Step #3. I am a healthy + fit person who drinks 100 ounces of water a day because it makes me feel amazing and I love it. We are social creatures. We long for connection (whether we know it or not). You want to reach your goals? Don’t go it alone. Find others to go through the journey with you. This is a crucial step; don’t be tempted to skip it. Accountability and support are ridiculously important my friend, when it comes to change. – Grab a friend who wants to make the same change you do. Hold each other accountable. – Join a Facebook group. – Tell a close friend or significant other your goal, and ask him or her to support you by holding you accountable. There you go… five steps to reaching your New Year’s goals. Remember, each day is Day One. If you slip up, just start again. Let me leave you with this – you can do anything. I promise. Yes, change is hard, but if you can master the process, then you’ll be unstoppable! We’d love to hear from you in the comments below: what is the ONE change that you are going to focus on? Alicia Murphy is a fitness expert for people who want to get ridiculously fit by training their stress response. She also trains Team Skechers on site at their headquarters in Manhattan Beach, California. Through her totally addictive HAPPYness Hours, free challenges + virtual programs, she’s here to help you shake up your approach to stress—and learn to use it as a tool to achieve your health goals. When she’s not coaching, you can find her running on the beach or hanging out at Disneyland with her son. Meet Alicia + transform stress into your SUPERPOWER at StressMonkee.com. We absolutely adore Brooke Burke-Charvet. She’s been a beloved member of the Skechers family for years, and she handles everything with such grace and style – whether it’s her role as our ambassador, a contestant on The Celebrity Apprentice, or as a busy mom of four (plus she has an amazing stash of incredible tips we love). Stay tuned for Brooke’s upcoming spot this season and the new Skech-Knit collection. What’s your favorite Skech-Knit shade? Tell us below! We’re starting 2017 in style by giving one of Skechers’ biggest trends of the past decade a sparkling new update: the D’Lites Diamond Anniversary Collection, starring four bold new styles (Be Dazzling, Style Revamp, Shiny and New and Diamonds Are Forever)! For 10 years, Skechers D’Lites have been a hot trend for our brand – launching in the States and becoming a fashion movement that spread across Asia, where top K-Pop groups Sistar and EXO have backed the collection. The heritage sneaker has been worn by global pop stars, fashion influencers and millions of fans worldwide. So we couldn’t resist but salute this amazing style and give it the glam it deserves. The Skechers D’Lites Diamond Anniversary Collection rocks lots of rocks, but also a lot of comfort: it’s been modernized with awesome lightweight features and cushioned Skechers Air-Cooled Memory Foam. Our four new styles in this collection are all bejeweled in black and white, but each one is distinctly embellished with its own diamond rivets and bold metallics. To celebrate this new trend, some of the hottest influencers around have been lacing up in their Diamond D’Lites and rocking this hot new look – everyone from Miss Minus Sized to Mermaid Waves! We love showing our Diamond D’Lites off with a classy outfit, or dressing them down with a pair of jeans. Have an old pair of D’Lites that you love? How would you style your own Diamond Anniversary pair? Tell us in the comments! Now that we’re a couple weeks into this new year, we reached out to a few cool friends on social media to see how Skechers is fitting into their plans for 2017. In a wider world sometimes filled with chaos and uncertainty, it’s often a relief to find a sense of grounding and focus in our personal everyday lives. From new motivations to goals to adventures and more, these amazing women might have some ideas to help you pinpoint your strategy to totally dominate in ‘17! Clare Smith blogs about training the body and soul at www.claresmith.me. Seen at top and below, she put the Flex Appeal 2.0 – High Energy to work while pushing through a session at the gym. And the reward for working hard was some well-earned relaxation time in the super comfy Descender – Denali boot. Finding that right balance is always key. Follow Clare on Facebook and Instagram. 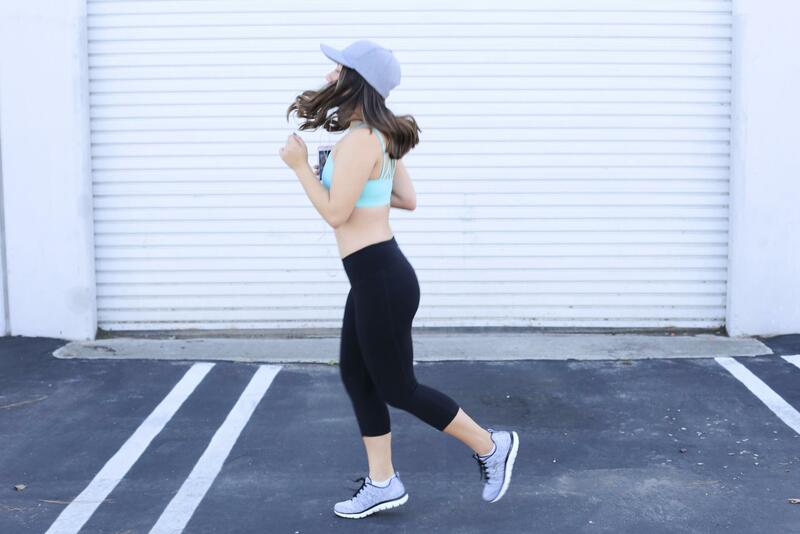 Check out Britney on her Fittybritttty blog to learn how she introduced Skechers to her new year goals. For Britney, treating one’s self to new workout outfits and footwear is the perfect motivation for continuing a healthy lifestyle into the new year. Even when going casual in the slip-on Double Up – Sleek Street, everyday errands or a dog walk can still become an exercise. Follow more of Britney’s journey on Instagram, Facebook and Twitter. Elizabeth Dickerson writes about finding inner strength through fitness, travel and more on her blog FromSkinny2Strong. Wearing the comfortable Flex Appeal 2.0 – Insights slip-on knit sneaker, it’s easy to zone out on a moment of reflection to decide what will be left behind and what will be done differently in the months to come wherever the urge strikes. For Elizabeth, the key to happiness is finding that perfect balance in life. Follow how she’s doing it on Instagram and Twitter. For her first post of 2017, Ciera of WorldwideStylista focused on stepping up the fitness game. She offers five tips to help reset priorities and improve your chances of achieving your realistic goals. Her final tip—invest in new gear—is illustrated by the lightweight and knitted Flex Appeal 2.0 – High Energy sneakers that she laced up before getting down to business. These easy-to-wear sneakers will carry you to the gym, through the workout, and back home again with comfort. For more from Ciera as she journeys through life, follow her on Facebook, Instagram and Twitter. Personal stylist Kirby Morris loves sharing her inspirations for fashionable and affordable looks on her blog, Fashion by Day. She even finds fabulous workout style and knows how to make the natural colored knitted Burst – City Scene sneaker pop by pairing with smart athletic gear. If shifting into this new year proves anything, it’s that amazing style is totally timeless—even when striving to meet your fitness goals. Follow Kirby to see her fantastic eye for style on Instagram, Facebook and Twitter. That’s a lot to digest as we start the new year. We hope you find something to help spark inspiration towards meeting your goals! Let us know what Skechers style drives your motivation in the comments! It’s 2017! A new year and an entirely new chance to find a solid resolution – why not make yours to be more stylish? 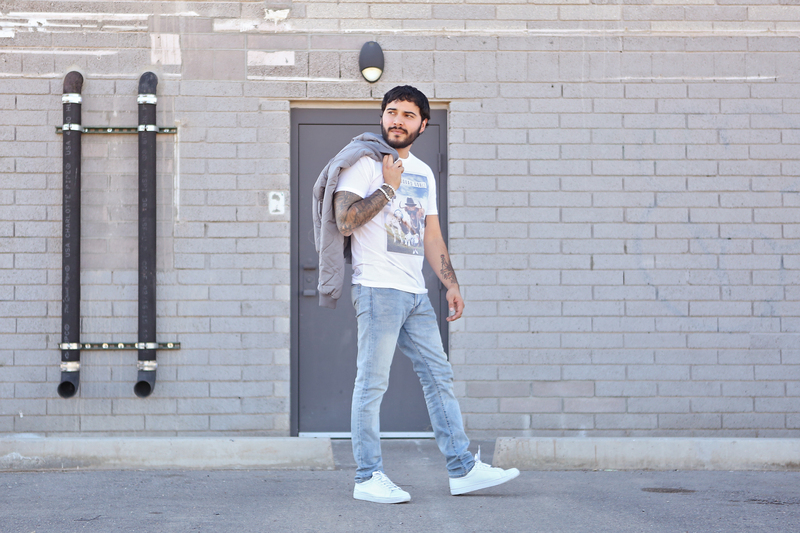 Switch up your look by finding new ways to wear your favorite pair of Skechers with Samuel Anthony of The Frenchy Toast. As editor of The Frenchy Toast, my goal is to keep men’s fashion simple. I strive to provide men with tools to help them integrate the latest trends into their daily lives. I am thrilled to partner with Skechers to share tips on achieving the perfect street style look. 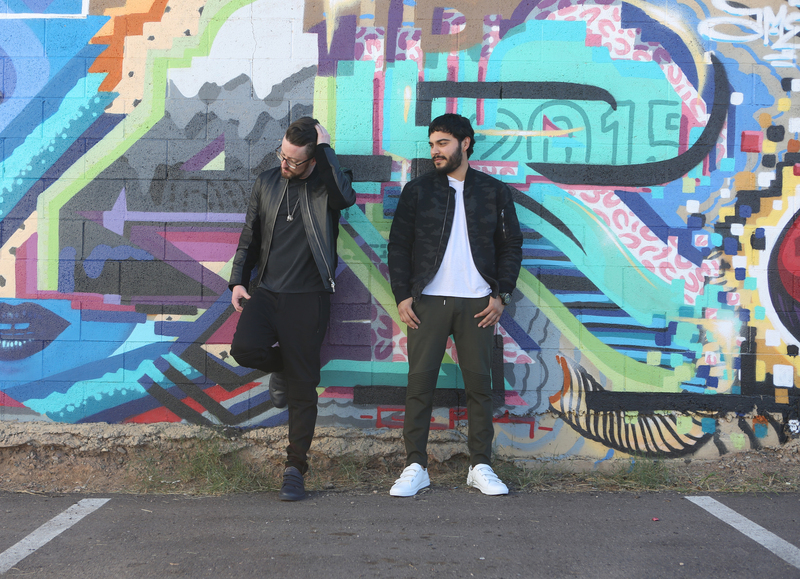 My business partner, Erik Velasquez (AKA @CasualFridaze51) and I partnered with photographer Natalie Miller to shoot these looks in downtown Phoenix. Although Erik and I shoot each other every week, it was exciting for us to both be in front of the camera. It sounds crazy, but it was actually our first time shooting together! TIP #1: Get more use out of your athletic shoes (get Samuel’s Flex Advantage 2.0 – Missing Link style here) or casual sneakers (get Erik’s Crossroads shoe here) by dressing them up with a lightweight sweater or collared shirt. TIP #2: Switch up your next casual look by mixing your favorite pair of Skechers sneakers (get Erik’s Bunker soles here || Samuel’s boots at select Skechers stores) with a heavy knit cardigan. TIP #3: Pair Skechers work boots (get Samuel’s Skechers Work Relaxed Fit: Pettus – Grafford St boots here || Erik’s Bruiser boots here) with dark denim and a flannel for one of our favorite go-to outfits. TIP #4: For the quintessential street style look, grab tailored joggers and pair them with the all-new Bunker sneakers from Skechers (get them here) along with a fitted bomber jacket. Remember to have fun! Wear your clothes, don’t let them wear you!! 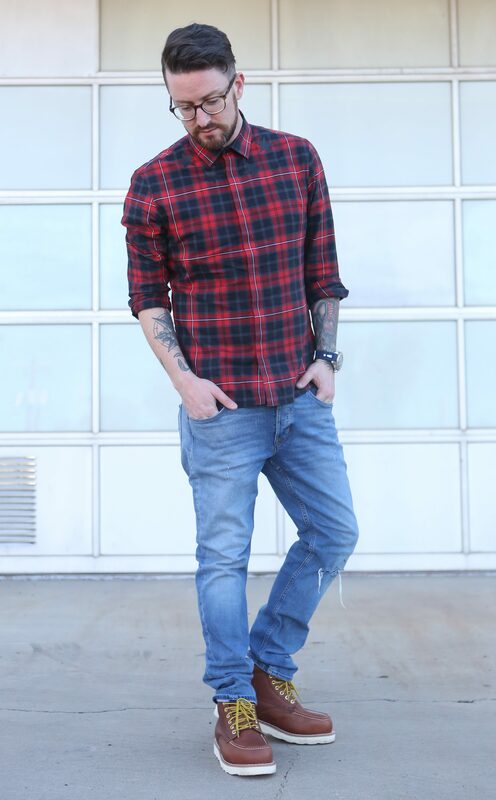 Erik in the Mark Nason Los Angeles Venice sneaker. Skechers offers a variety of options for each one of these looks. Use these tips as starting points as you start to develop your own personal style. Have more questions? Not a problem – leave them in the comment section below, or feel free to reach out to @SamuelAnthony via Instagram. Above: Erik in the Briggs boot; Samuel in the Mark Nason Goodman boot.